DALLAS (AP) — Dirk Nowitzki was ready to take the court Wednesday night — at halftime, for a ceremony in which the Mavericks star was presented a key to the city by Dallas Mayor Mike Rawlings. As for when the 7-foot German’s record 21st season with the same franchise will begin after a longer-than-expected recovery from ankle surgery seven months ago, Nowitzki said the goal is sometime in December. The 13-time All-Star had surgery to remove bone spurs from his left ankle just before the end of the 2017-18 season. Nowitzki was on schedule to be ready for the start of this season before a setback led to tendon soreness just before the start of training camp in September. 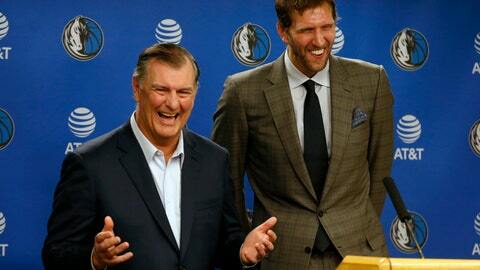 Nowitzki spoke alongside Rawlings before the ceremony during the Mavericks’ game against Brooklyn. Nowitzki is set to become the first player to spend all 21 seasons with the same team. Until he makes his debut, he will technically share the record of 20 seasons with Kobe Bryant, who retired from the Los Angeles Lakers in 2016. The 2007 NBA MVP said he started running on a treadmill about two weeks ago and has steadily increased the intensity. Nowitzki has played in a couple of games involving staff members during practice. But until he goes through several full practices, his debut will have to wait. Nowitzki said the significance of this debut hasn’t made him any more anxious than the painstaking wait when all indications were the surgery wouldn’t affect what could — and many presume will be — his final season. Nowitzki said he wasn’t ready to decide how the injury will influence a decision on a possible 22nd season. Either way, Rawlings didn’t want to wait past this season to honor the player who led the Mavericks to their only championship as the NBA Finals MVP in 2011 and is the highest-scoring foreign-born player in NBA history with 31,187 points, seventh on the all-time list. Rawlings lauded Nowitzki for his willingness to be visible in public, mentioning that he was elected the same night Nowitzki was celebrating a birthday and they ended up at the same club. “That was LIT!” Nowitzki interrupted, drawing laughs.